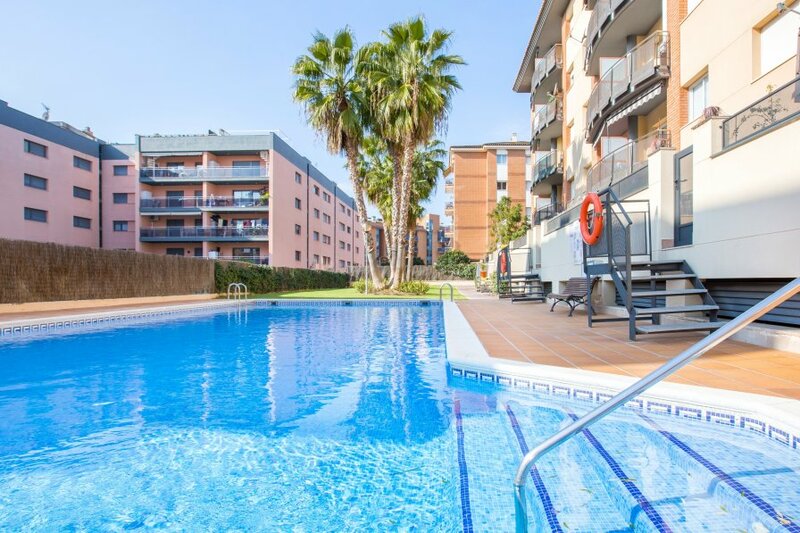 Apartment (64 m2) located in Lloret de Mar, in the area of Fenals, 300m from the beach and 400m from the centre. It has 2 double bedrooms (1 double bed; 2 single beds), a living-room (TV; sofa-bed), a kitchen (microwave and ceramic), washing machine, a bathroom, and a terrace (38 m2). In a complex with shared pool and garden. Garage. The car is not obligatory to go to the beach, to the center of the village, supermarkets,restaurants....It is possible to be walking perfectly for his proximity.There are buses nearby, to be able to go to Lloret de Mar, Blanes.... The nearest beach Is Cala Sa Boadella, or the Fenals Beach. Fenals Beach is a pretty stretch of the Costa Bravas coast with 500m of the characteristic coarse white sand beach of the area. Umbrellas and deck chairs are provided to rent as well as activities like pedal boats, para sailing, and water- skiing and canoeing. Also you can taste the Mediterranean food, fish and paellas, in the restaurant placed on the beach. This use to be rented to families. in case of young people, is necessary to inform us before doing the booking, to could confirm the possibility to the owner.